A commonly asked question about your titanium driver head is, why is there such a large disparity in price between two similar looking driver heads? Excluding mark up and promotional expenses, the best way to separate the two is by comparing how they are made. There are two popular methods used to make a titanium driver: forged vs. cast. The forged head derives its name sake from the use of a 500 ton press in its production process. For all fairness, the forged Ti heads are at best miss-labeled. As they are actually made by cutting and stamping a sheet of titanium sheet into several different parts of the driver, and then welded together with an Arc welder. 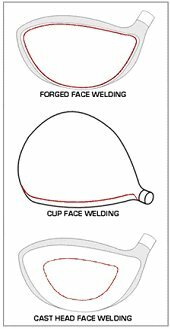 The most common construction is a 4-piece body, under which the driver head is made up of the crown, sole plate, face and hosel. The face could be made of Beta Ti or 6-4 Ti, the crown 6-4 Ti, and the sole grade 9 Ti. Grade 9 Ti is usually used because it is softer and easier to form the intricacies that are common with a typical sole plate design. The cast Ti driver usually has a 2-piece body. The main body and the club face. The main body is made out of 6-4 Ti and the club face could be either Beta Ti or 6-4 Ti. The face is attached to the body by either an Arc weld or Plasma weld process. The preferred method is Plasma welding as it is much hotter than Arc weld. It creates better bond and a thinner weld line. The titanium investment casting is a lost wax process, not unlike its counter-part in casting stainless steel parts. However, it requires a melting furnace and a separate vacuum casting furnace. These furnaces and related factory fixtures require substantial capital investment. The benefits of investment casting are thinner wall thickness, complex geometry, reproducibility and dimensional accuracy. The main disadvantage is that its production cost is nearly twice that of the stamping process. Nearly all top of the line name brand titanium drivers are made with the investment casting process for its consistency and accuracy.